Pav Bhaji is a very popular fast food dish in India. The mouthwatery taste is liked by almost everyone. This comes in various flavors and Paneer Pav Bhaji is one of them. Paneer makes Pav Bhaji really special. Pav is the Indian buns and bhaji is the spicy mixed vegetable masala. The pav is slathered with butter and toasted on the hot tava and served hot with delicious masala. You may have to go to a nearby Indian store to get the “ Pav Bhaji Masala “ that is the special ingredient of this dish. I used “ Everest Pav Bhaji Masala “. Give a try & Enjoy..!!! 1. Pressure cook cauliflower, carrot, beans, peas and potatoes till they are soft and cooked. 3. Add onion, ginger garlic paste and sauté for a minute. 4. Add cumin and pepper pwd. 6. Add turmeric pwd, red chilly pwd to taste. 7. Sauté for few seconds. 8. Add tomato puree, cooked vegetables, butter and Pav bhaji masala. 9. Keep sautéing and mashing it together till it is a smooth mixture. 10. Add lemon juice and shallow fried paneer. 11. Add required water and keep in simmer for 5 minutes. 12. Once the flavors meld together and rich aroma comes out, remove from flame. 13. Garnish with freshly chopped cilantro leaves. 14. Delicious Paneer Pav Bhaji masala ready. · Take a flat fry pan. · Add generous amount of butter and toast the pav breads till it is slightly golden and crisp. 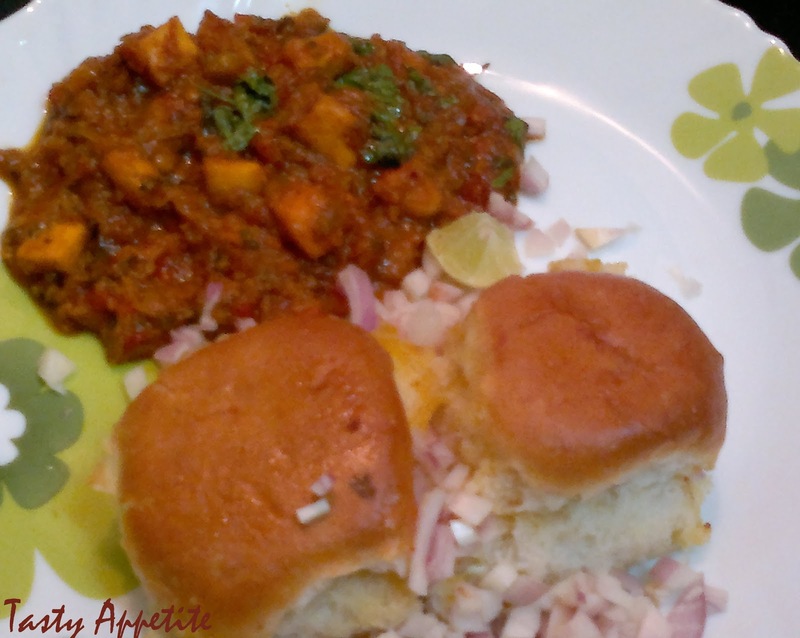 · Serve hot the toasted pav breads with Paneer pav bhaji masala. · Garnish with finely sliced chopped onions, minced cilantro and wedges of lemon. I really love this dish, it reminds me of something we eat here! Yummy..love paneer pav bhaji..specially my son...almost on fridays this is our menu for kids..
my sons all time favorite evening snack...yummy and delicious paneer version! yummy no one can say no to this yumm n delicious paav baji..
Nice idea,have had cheese,but paneer is nice idea! never knew such dish exists, but gr8 idea and must be yummy, will try ur recipe jay, as both are my daughter's favorite. Hi Jay, this dish look delicious, yummy. Yummy!!!! now who can resist a pav bhaji?? And that too with paneer??!!!! I heart this!! 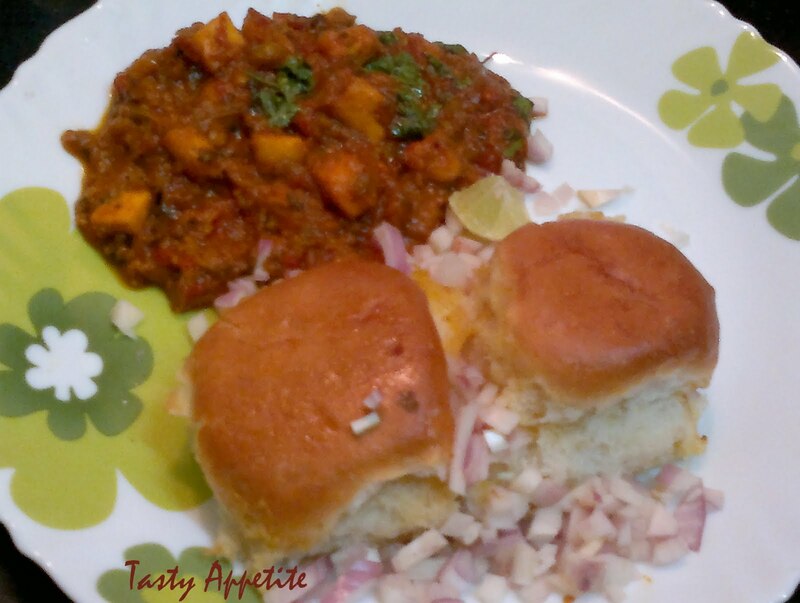 lovely pav bhaji recipe dear. Looks so yummy and tempting. Nice recipe. One of my favorite dish, looks super delicious. Paneer is an interesting addition to the bhaji! One of my favorite recipe..Nicely done. Thanks Jay for tagging me.Will write a post soon !!! If thats a fast food in India! I can have that everyday.